For the past three years or so, I’ve been living in a lovely townhouse; a simple, small low maintenance place that has allowed me to settle into a new lifestyle. I am grateful for having had the place and for my neighbors and the walkable downtown. But it’s not a place that is especially suited to art making. Not quite enough space and the space that it has is just a bit too nice to throw paint around in. I’ve made it work and carried canvas up and down the stairs, covered the pretty mouldings so I wouldn’t get paint on them and shuffled things here and there to make do. It’s been great, but I finally decided that it was limiting my choices of what to paint. No bueno! A change was in order. I feel like I’m getting a big girl’s studio! I real working space that will let me move in any direction I desire with utility and ease. It has enough space for small workshops and weekly classes! Yippee!! Weekly classes are something that I’ve wanted to be able to do since I closed my large studio space in Milwaukie. Plus it’s got an amazing amount of storage! Apparently the former owner ran estate sales and needed the out-buildings that are on the property – three of them! I couldn’t believe that my realtor found it for me. It’s absolutely perfect; small house, big studio, garage, storage shed and and extra detached office. Wow! I’m moving in on Halloween. Spooky! I have also been very busy this year launching my new website and videos (check out landscapepaintinglessons.com) and I’m about to launch a second site that will offer subscription online lessons. So, I’ve been diverted from blogging, but I hope to get back to it and share what’s happening on my painting journey. I’ve been doing weekly mini-lessons on the new site which you can subscribe to , but I consider this blog a lovely, more personal view from the easel! I miss it! So stay tuned for pics of my new studio. Hopefully it will give you some ideas on studio space or if you have any cool ideas, please, please share! I can’t wait to roll those easel in there!!! 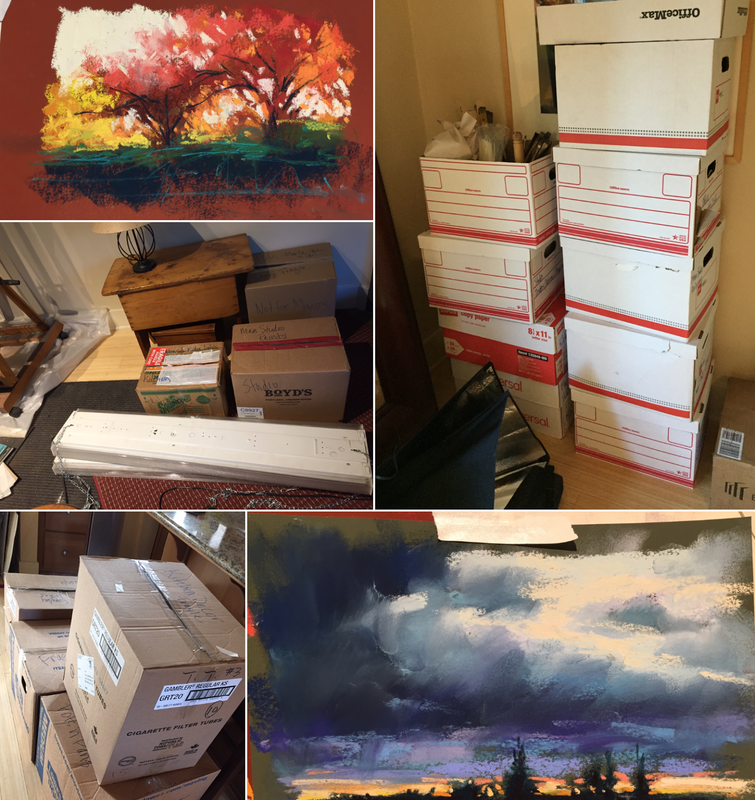 For a few more days, I’m painting amongst the boxes and relative chaos. It’s a good kind of chaos. Yes, it is the season of change for me also. We sold our beautiful garden and remodeled 100 year old house in 1 day for full price. It's been very emotional looking for a new place out of Mult. county. Hi Marla, When I go to your website link I just get a blank page? Hi Marla, I just thought to try visiting your site via Safari rather than Firefox and it works fine in that browser. I tried googling your site and accessing it that way via Firefox but I just get all blank pages regardless of which page I visit. There is obviously a problem with your site being view via Firefox which is a shame as it is a very popular browser.